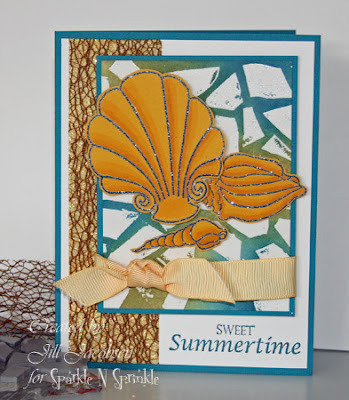 Shared Inspiration by Jill Jacobsen: Ready for Stampfest!! I'm getting ready to go to Orlando this weekend for the Stampfest show!! I'm so excited to share all the new techniques that I have. I have 4 new techniques that I will be demoing at the show this time!! The first one is the Mosaic Background. Remember last week on the SNS Blog April shared this technique...I had done it a while back, but never did anything with it...she reminded me about it and I really like the way it came out! The second is the net ribbon that we just got...it is a 1 1/2" ribbon, so I put down 2 strips of the 3/4" Tear-fic Tape and then the ribbon on top of that then covered it with glitter! Such a great look!! You will just have to come to the show to see what the other 2 techniques are!! But they are new and fun so be sure to stop by and see me if you can! How about sharing pic's of your techniques from the show upon your return.We'd all love to see them. The mosaic looks neat with the shell. I have this ribbon and will try the glitter with it! Great job! Love your mosaic look. Wonderful card!! 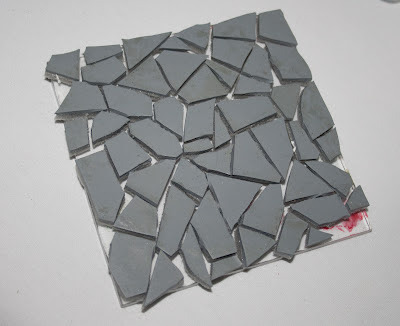 Isn't this a great way to use those rubber scraps. Saw you actual card at Scrapbook Expo and it was fantastic.